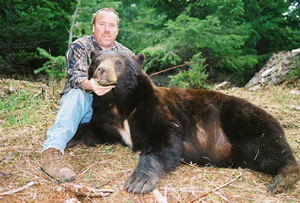 NOW Booking and taking deposits for this years SPRING BLACK BEAR season! Book your 2019 hunt NOW for a hunt of a lifetime! 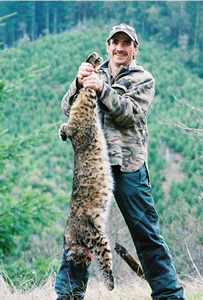 One of the only remaining species of game left in Oregon that you can hunt with hounds, and one of two spotted cat species to hunt in North America, Bobcats are as exciting to hunt as they are beautiful to admire. Both Eastern and Western Oregon hold dense populations of these spotted pelts, some in excess of 30 lbs. like this one. Come hunt with our top quality Treeing Walker hounds to experience a race of a lifetime! Featured in this NEW Video, "Hounds In Hot Pursuit"! Oregon's Cascade and Coastal Black Bears grow BIG! It's estimated that Oregon has more Black Bear than any other state in the lower 48. We stalked over 65 bears during this year's Spring season alone. Steep terrain, dense cover and overly abundant food sources make Southern Oregon excellent Black Bear habitat! Throw in the fact that we are spot and stalk ONLY; as hunting Black Bear with hounds has been outlawed in Oregon since 1994. These factors combined make Oregon's Black Bear populations even more PLENTIFUL! Featured in this NEW Video, "Bears Gone Wild DVD Release"! Read one client's recent posting at "Long Range Hunter"
They are not called the grey ghost for nothing. 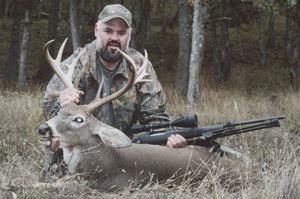 A hunter is truly admired on the West Coast if they have harvested a trophy blacktail deer. Up your odds by drawing a coveted late season tag, or by going with a primitive weapon hunt. Good bucks are becoming more and more plentiful; Southern Oregon is the spot where more big bucks are killed than anywhere else, sporting tall, long tined, frames! Columbian Whitail Deer! Huntable again since 2005, this small sub-species is only found in Oregon and is only huntable in a very small area in Southern Oregon. This sub-species is recognized by SCI and the Oregon Record Book. Join us to complete your North American Deer Slam! 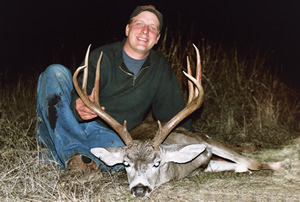 Typically in the 100 inch range, a World Class buck can eclipse the 140 inch mark. You'll have to draw a coveted tag, which are available in both rifle or archery hunts, or contact us very early for a limited LOP tag. We have a few Non-Typical bucks as a bonus!